The UP College of Medicine Class ’90 invites you to donate to a fundraiser for the renovation of the Pontificio Collegio Filippino (PCF), the “Home in Rome” for Filipino priests doing further studies. Supporting the PCF is a concrete way of helping our country. When the priests return after two to four years of study, they are assigned to the seminaries and other special ministries, including health-related apostolates such as hospital chaplaincies, bioethics committees, orphanages, feeding programs, drug rehabilitation, care for abandoned children and elderly, and so on. ACCOUNT NAME: University of the Philippines Medical Alumni Foundation (UPMAF), Inc.
US-based donors may make a tax-deductible gift (US IRS 501c3) via Friends of the Collegio. This is in connection with the Lenten webinars to be given by Fr. Gregory Ramon D. GASTON, Rector of PCF, on March 22 and April 5, 2019. CPD and CME credits are available (see at bottom of this page on how to register for free). Every year, at this time of the year, I give me way to my medical school classmate, Fr. Greg Gaston to share his thoughts. “The Lenten season invites us to reflect a bit more on God’s love, in preparation for Easter. Ash Wednesday reminded us of our nothingness, a nothingness that we especially experience when we deal with the sick and dying – that indeed, from dust we came, and unto dust we shall return. But with God’s infinite love, we become his greatest creation. Lent invites us to prayer, fasting, and good works. This is foolishness to some, who might see them as an invitation to waste our time, and even to harm and punish ourselves. But when we pray, we turn to God who is our source of life and being. Fasting makes us forget ourselves a bit and reminds us to unite ourselves with those who have less in life. Good works bring us to share with others not only our spare time, coins, or old clothes, but our very selves. 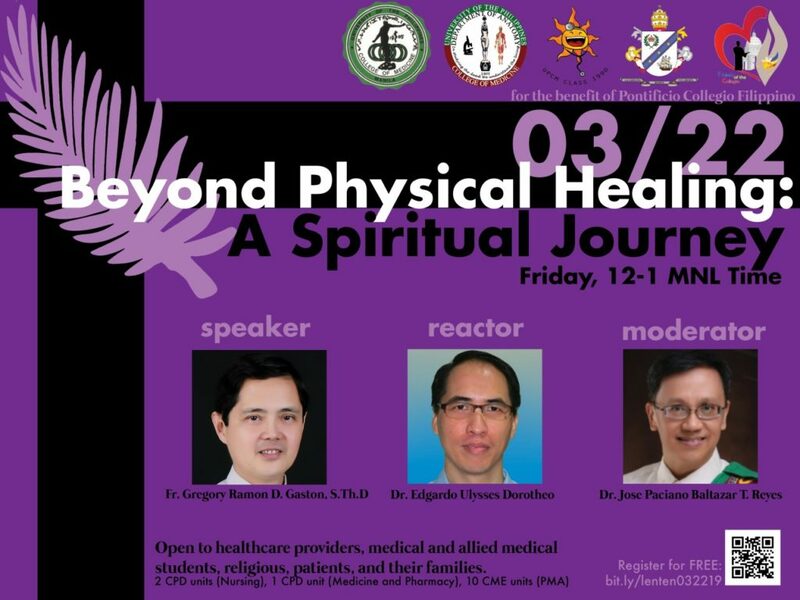 The UP College of Medicine (UPCM) Class 1990 is holding a 2-part Lenten recollection webinar series by Fr. Gregory Ramon D. Gaston, SThD, rector of the Pontificio Collegio Filippino (www.pcfroma.org & www.friendsofthecollegio.org). The Collegio is the residence in Rome of Filipino priests doing further studies for two to four years, after which they are assigned to various seminaries and specialized ministries back home in the Philippines. Fr. Greg did the first two years of Medicine proper with our batch, after which he discovered his vocation to the priesthood. 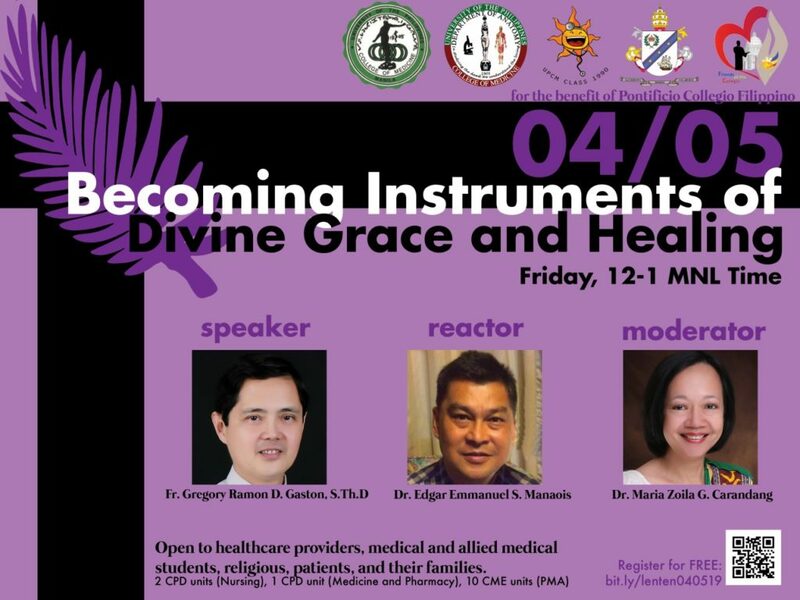 Open to all healthcare providers, medical and allied medical students, religious, patients and their families, here and abroad. CPD/CME units are available for MDs, nurses and pharmacists. Join online through UP Manila livestream and FB LIVE using any computer or mobile device.